Winds are blowing, leaves are turning green, and birds are chirping beyond the walls of Concordia College. To some Cobbers, these signs of spring mean that Cornstock and graduation are fast approaching. To many, they call to mind a less exciting occasion: finals week. Everyone studies for finals in their own way. Some students like to work as a group, while some need absolute silence. Some start making flashcards and outlining papers a month in advance, while some prefer to pull all-nighters before exams. No matter what your study style is, there is bound to be some place at Concordia, or at least close by, to suit your study needs. With the help of some of my fellow Cobbers, I have compiled a list of some of the best study spots Concordia has to offer. Personally, my favorite spot to work alone in the Carl B. is the periodical section on the second floor. Cubicle-like desks line the wall, each with their own lamp and window view. It’s secluded enough that I do not get distracted, but it’s not as quiet as the fourth floor. Plus, if you work back there at night, the lamps cast a warm, comfortable glow. If you have a group project to work on, or you just like to be a bit more social when you study, the mezzanine (known as Serendipity to most students) is the place for you. 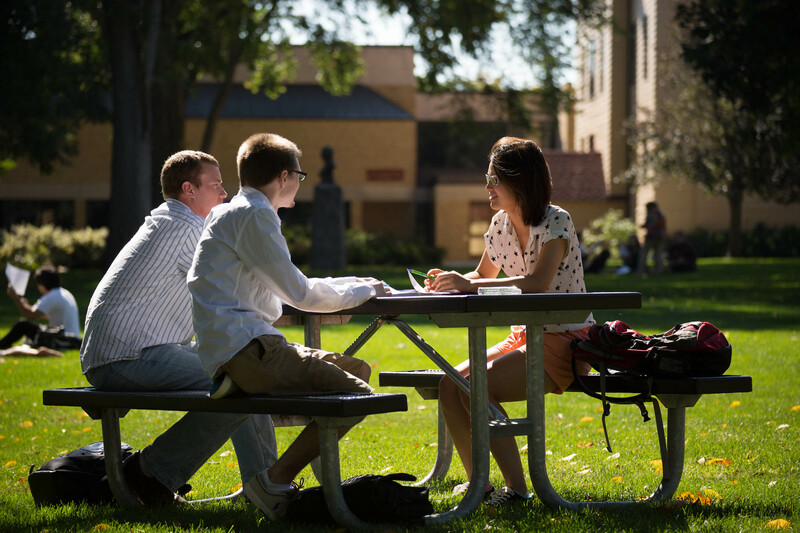 On those rare, warm Minnesotan spring days, it can be nice to take your study materials outside for a little bit. The two most popular outdoor study spots at Concordia are Prexy’s Pond and Olin Hill. If you lay out a blanket and some books by Prexy’s, you may be joined by some friendly ducks; if you set up your spot on Olin Hill (reportedly the highest point in Moorhead), you might be able to take a study break and join in on a game of Frisbee. 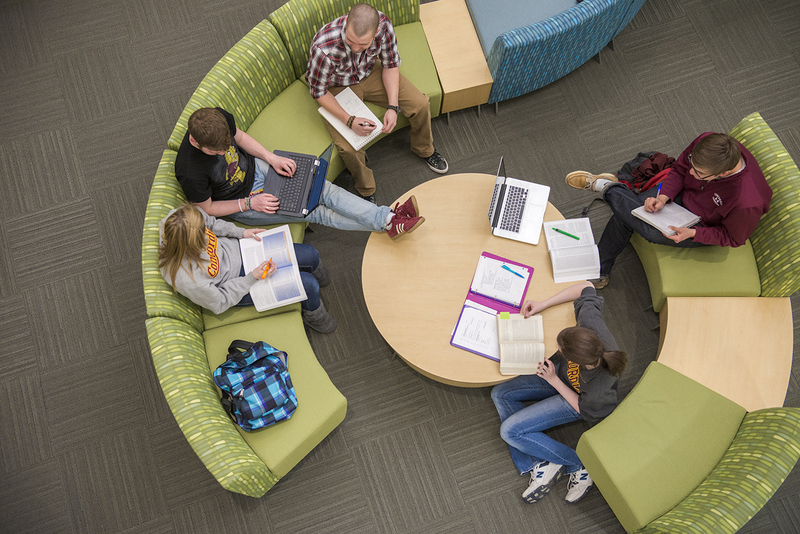 The Knutson Campus Center is the hub of Concordia’s campus, and it also offers some great study spots. If you go to Anderson Commons between busy meal times, you can claim an entire table for yourself. Extra perk: unlimited coffee and cereal. 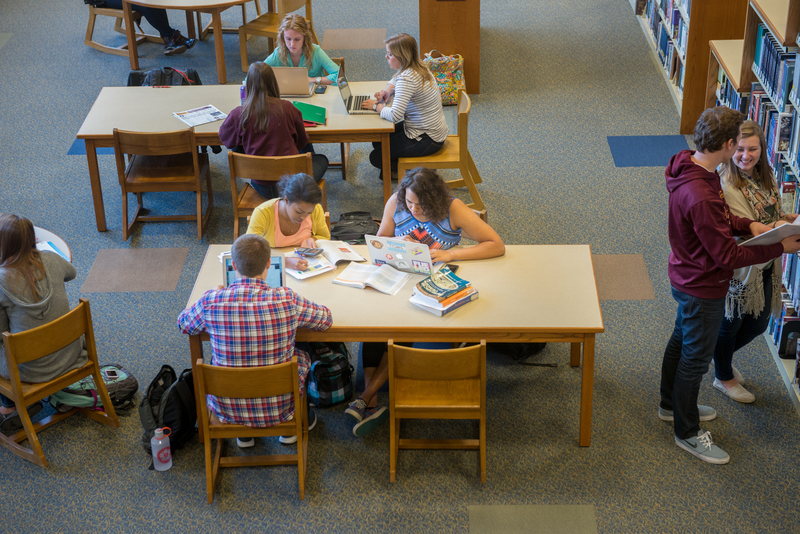 Comfortable chairs are spread out all over Knutson and make for wonderful study spots. The chairs in the Atrium are good if you like to socialize, but if the constant flow of people is distracting to you, you can head up the stairs toward the Parke Student Leadership Center. To the left and right of the staircase are relatively secluded bays of chairs and couches. Finally, there is The Maize (because what could be a better study snack than Maize fries?). I am particularly fond of the semi-circular booths – I even took a nap in one during finals week last spring. As a communication studies and journalism student, I have spent very little time in the Offutt School of Business, across the street from Concordia’s main campus. However, my friends who have classes there or live in the adjacent residence halls, Hallett and Erickson, tell me that the second floor of the building is a wonderful place to study. Along the western hallway, next to the terrace, there are tables, chairs, and white boards for working out problems. Plus, the building’s windows and open floor plan let in tons of natural light. Every dorm on campus comes complete with a desk for each student, so you may not even need to walk outside to find your favorite study spot! If you find that your roommates are distracting or your bed is calling your name, you can also check out your dorm’s basement lounge. The basement of Brown Unit 7 has a laundry room, so I like to go downstairs and study in the lounge between loads of laundry. 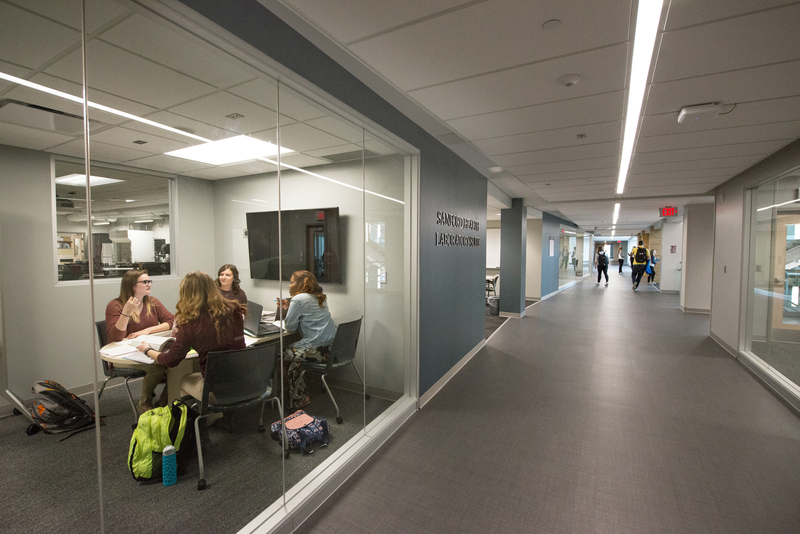 Unveiled in the fall of 2017, the Integrated Science Center, otherwise known as ISC, is the newest hot spot to unwind and study. With study rooms, tables and white boards on each floor you are sure to find a spot perfect for your study needs. Study rooms are ideal for group projects and meetings or a quiet room to yourself if you prefer. Of all the great spaces in the ISC, Jolicoeur Commons is my favorite place to be. Surrounded by the bustle of students, it provides the right amount of socialization needed to keep me sane while studying endlessly for finals.